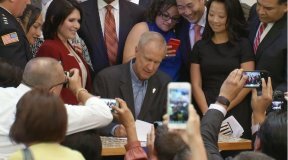 On Monday, Illinois Governor Bruce Rauner signed the Illinois TRUST Act (SB 31) into law. Under the TRUST Act, local police cannot comply with immigration detainers or warrants not issued by a judge. Local police also cannot stop, search, or arrest anyone based on their immigration or citizenship status. The legislation won support of law enforcement as a common-sense approach to create a clear distinction between the work of local police officers and that of federal immigration agents. 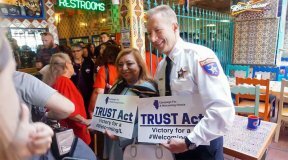 The TRUST Act was designed and supported by the Campaign for a Welcoming Illinois. The TRUST Act was sponsored by Representatives Emanuel “Chris” Welch and Lisa Hernandez in the House. The bill received bipartisan support in May when it passed in General Assembly. “Thanks to the tireless efforts of community leaders and advocates across the state, Illinois now has the strongest statewide protections for immigrants in the country. The Illinois Trust Act will benefit all Illinois residents regardless of race, gender, or religion. It will allow families who are here raising children and contributing to our state’s economy to feel safe to go about their daily lives without the fear of being separated from their loved ones,” said Hernandez. The TRUST Act restricts local law enforcement from collaborating with federal immigration enforcement agents to detain anyone without a judicial warrant. This law will provide an unprecedented level of protection for Illinois’ half-million undocumented residents who could otherwise enter the deportation pipeline through any simple interaction with police including a traffic violation.